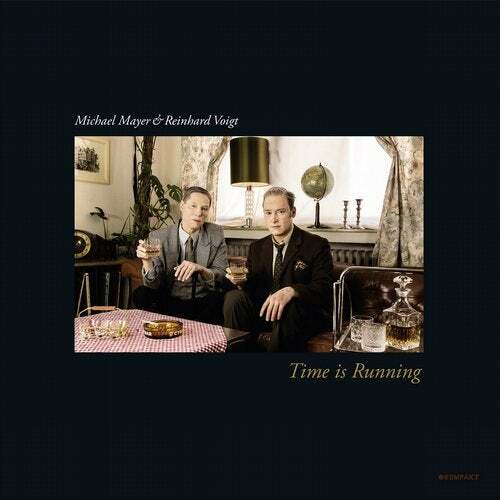 It's the long-awaited return of a classic combo - Kompakt luminaries MICHAEL MAYER and REINHARD VOIGT join forces for TIME IS RUNNING, the latest addendum in an ongoing conversation that brought us iconic releases such as Speicher 2 (KOMPAKT EXTRA 2, including the cuts "Pride Is Weaker Than Love" and "Supertiel"). As was to be expected from producers as floor-savvy as these two, the new offering bears all the hallmarks of a club favorite, incorporating the crisp rawness of early Kompakt stompers as well as the sophisticated sonics to be found in our current catalogue. Ever since the days of Cologne's legendary techno supergroup Forever Sweet, MICHAEL MAYER and REINHARD VOIGT have teamed up in one way or another, sharing credits on label milestones like "Sky Dumont" (KOMPAKT EXTRA 28) or "Unter Null" (KOMPAKT EXTRA 07). The new release TIME IS RUNNING sees them presenting their own solo work, evenly spread over two sides of the same coin - a compilation of sorts, but with all the characteristics of a close collaboration between soulmates united under one groove. And based on the hilarious (and somewhat bittersweet) cover picture, this bond is not going to dissolve any time soon, as the two friends imagine themselves as techno retirees toasting to a full live spent amid beats and bass lines. The A-side of TIME IS RUNNING holds a particularly sure-footed entry in MICHAEL MAYER's track portfolio, with THE STICKLER being a welcome update on his more raucous output. The straightforward thump of this cut comes with sizzling percussion, siren-like synth stabs and throaty bass - a hearty techno romp that doesn't seem too interested in making prisoners. The flipside takes a similar line with THE BUDDY, a rock-solid floor jam from the hands of REINHARD VOIGT - it's a more than fitting contribution, enforcing the producer's madcap hypnotism with paranoid synth squelches and tenacious beats. If that's how old age sounds, we can't wait to hit that pension fund.